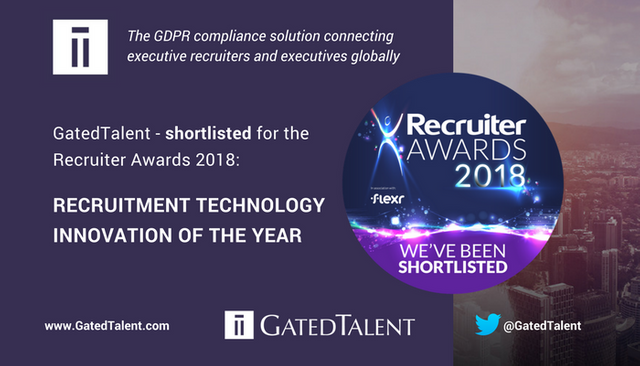 GatedTalent - the GDPR compliance solution connecting executive recruiters and executives globally - has been shortlisted for the RECRUITMENT TECHNOLOGY INNOVATION OF THE YEAR Award. Recruitment’s iconic Recruiter Awards were established in 2002. The Recruiter Awards gala is the UK’s largest event for the entire recruitment community recognising outstanding achievements by agencies and in-house recruiters. Achievements in recruitment marketing and technology also are spotlighted on the night. The Awards will be held in the Great Room, Grosvenor House Hotel, Park Lane on Thursday 3 May 2018. Jason Starr, CEO of Dillistone Group Plc, commented: "We are very proud that GatedTalent has been shortlisted for the Recruiter award for Recruitment Technology Innovation. Thanks to all our team members who have worked - and continue to work - so hard to make this happen!"